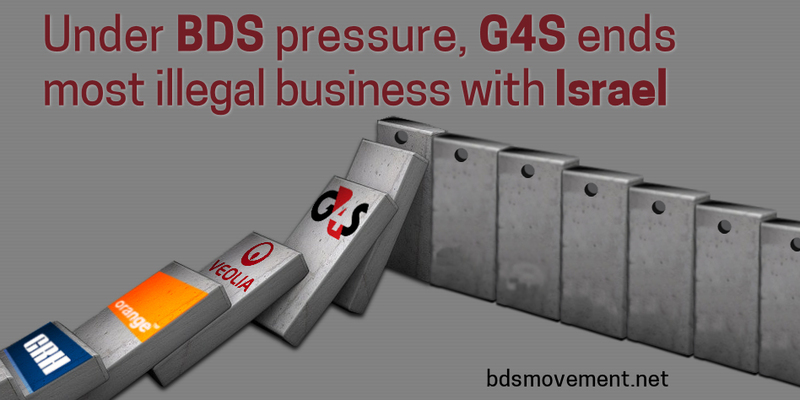 Despite the sale of its subsidiary, G4S will remain directly complicit in Israel's violations of Palestinian rights through Policity, the flagship national police training centre it co-owns, and the settlement-profiteer Shikun & Binui group. More recently, UNICEF in Jordan and a major restaurant chain in Colombia became the latest high-profile bodies to end their contracts with G4S following BDS campaigns. In June 2014, the Bill Gates Foundation divested its entire $170m stake in G4S following an international campaign. That same month, the U.S.​ United Methodist Church divested all G4S shares from its $20bn investment fund. The Public Institution for Social Security (PIFSS) in Kuwait decided to divest from G4S in June 2016 following calls from BDS Kuwait and the Palestinian BDS National Committee (BNC).